Despite Canada’s wealth management industry promoting a goals-based approach to advice, nearly half of full service Canadian investors say their advisors fail to deliver on even the first stage of that process, which helps them set goals that reflect their risk tolerance, according to the J.D. 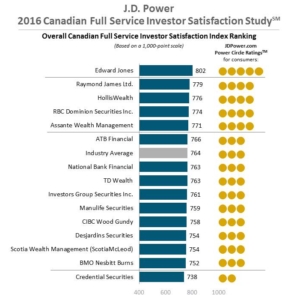 Power 2016 Canadian Full Service Investor Satisfaction Study,℠ released today. The study identifies three broad stages of goals-based investing: setting personal goals; implementing a strategy to achieve those goals; and monitoring progress. Only slightly more than half (54%) of investors indicate their advisor helped set goals and discussed risk. Barely one-third (34%) say their advisor effectively delivered on all three stages.